tri-state-camera has no other items for sale. The Monarch 5 all terrain binocular couples bright, high-resolution optics with legendary ruggedness in a package that is light enough to carry all day. Please confirm your shipping address before submitting payment. All orders must ship to the confirmed address submitted with your payment. Once payment is submitted, we are not able to modify the address in anyway. Understandable delay in delivery. Well worth the wait. A+ seller. 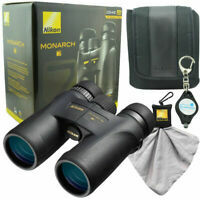 These were bought to give my back yard birding the same performance boost the Monarch 5 10x42's had given my long-distance birding. They allow me to quickly acquire the bird I'm looking at due to the wider field of view. Nikon has packed performance into the Monarch 5 line that rivals other brands at twice their price. 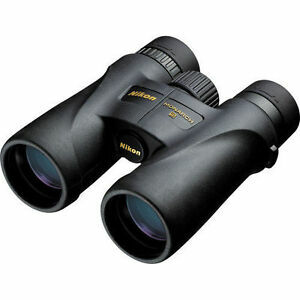 Sure, they cannot compare with a $2,000 + pair but for the serious binocular user on a budget these are a great choice. I'd go so far as to say most people would not be able to tell the difference. Good low light performance and edge to edge clarity make these a big step up from the lower priced options. They are easy to use with medium fast focusing. Mid-weight so I haven't noted them as uncomfortable to carry, All-in-all, a great product that has carved a definite niche in the mid-priced binocular marketplace. I LOVE my Monarch 5 binoculars which I bought 3 years ago. However, I recently bought the same model for my husband, and after just a few months with minimal use, the eye piece came off, unnoticed, while we were taking a walk. My disappointment is that when I wrote (twice) to the vendor I purchased it from via e-bay, TRI STATE CAMERA I never got a response. At this point, I'm trying to contact Nikon to see how to proceed from here. At any rate, I would definitely recommend these binoculars despite my recent experience. I'm thinking it's probably just an unusual quality assurance problem (Monday morning, tired employee...???) since my older pair is still holding up perfectly well. I see birds everywhere now. Best binoculars I’ve owned yet. The clarity is fantastic. Excellent field of view. Very comfortable neck strap. I can tote these along all day without feeling like there’s weight on my neck. I’m getting a second pair for a tripod in higher magnification. 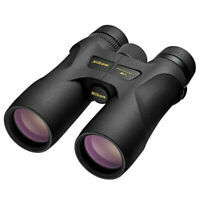 Fantastic for bird watching...great resolution and super easy to focus, once you get used to the wide angle. Really love these binoculars. Very easy to use with a grip that feels good to the touch. I find that I reach for them all the time now.